Sorry for the no post yesterday, the hubs and I have been moving into our new home and let me tell you, it’s a never ending process! With the big move happening this week, I’ve barely had time to get out of my sweats from all the cleaning and unpacking but yesterday, I was going a little stir crazy and I had to put something on and get out of the house (hence today’s soft, feminine yet casual look). If you love this cardigan I’m wearing see below for how you can get 20% off your next Calypso purchase by giving back! Calypso is be partnering with Clothes4Souls from May 8th-20th. Bring in a gently used dress, skirt, or shirt to donate to Clothes4Souls to receive 20% off a full priced purchase. You can find more info here. This outfit is awesome! I love the pink cardigan and the shoes! Love the Valentino flats in the light pink! The mix of the studs and feminine color make then extra cute!! 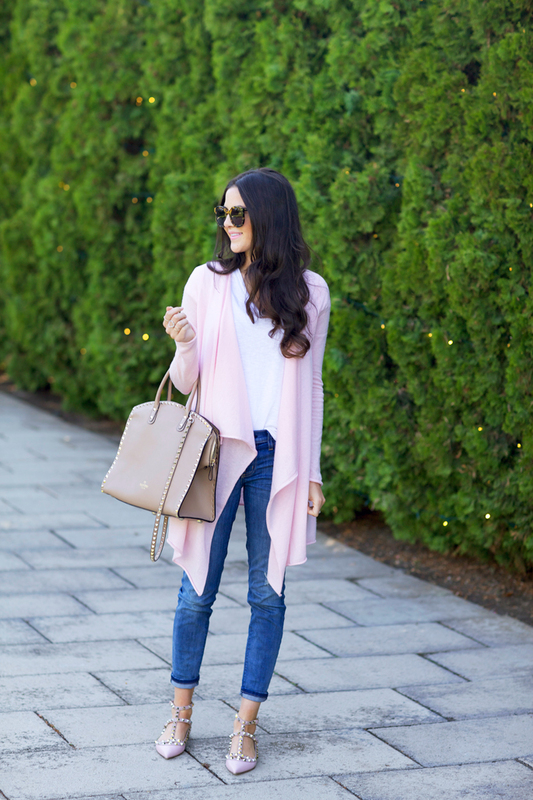 I love oversized cardigans, and this soft pink color is so pretty! The Valentino flats go perfectly with it! Your cardigan is beautiful! The title of this post is perfect! Moving is such a process, but it’s the best feeling when you’re all done! I absolutely love this look! So pretty! Adorable look. Love the cute cardigan and the Valentino flats. Love the soft shade of pink and these flats are darling. LOVE that cardigan! Looks amazing with your Valentino accessories! Pretty in pink, Rach. You look gorgeous. I hope it was a successful move! I love how casual and soft this look is. that cardigan looks so soft! Love this look! Esp the pops of pink. Have a wonderful weekend and hope the big move isn’t too tough. Can’t wait to see how your decorator that gorgeous home! love love love your flats and those jeans! super cute outfit!! Love this look! I love this cardigan. When I looked at the website though, the one it’s linked to is different (shorter) but I found the one you’ve shown here in petal as you’re wearing, in case anyone else is wondering. :) http://www.calypsostbarth.com/yvette-cashmere-cardigan?color=Petal Looks like they’re offering $50 off any regular priced cashmere cardigan too with code: CASHMERE50 which is awesome! Good luck with the move! this looks is so simple and feminine and you look still look so sophisticated! what a nice easy look. I love the soft feel of this outfit yet you give it a little edge with the rock studs. Gorgeous! Gorgeous cardigan!!!!!! Love your sandals are well. Good luck with the move!!!!! This looks so comfy and beautiful! Good luck with the moving – I HATE moving. But I’ve seen the photos of your new place on Instagram and it’s probably not so bad moving into a freaking gorgeous palace! It’s so pretty it doesn’t even look real! Moving is definitely a drag! But at least you were able to pull away for a quick minute to take some cute snapshots. Love the Calyspo cardi, it really is such a sweet color, and pair with the rockstud flat make this look perfect! Love these cozy pieces plus fab bag and flats! The blush color is beautiful! I love this look! The pink is gorgeous and those shoes are amazing! I’m loving the pastel pink color, it look great on you! Adore this look… The soft pink is so pretty and feminine. I definitely have an obsession with all things Valentino. I wore the ballet flats in cognac on my blog a few weeks ago. Obsessing over your cage ones. The color is just beautiful. Best of luck with moving! Always a stressful process, but so worth it to be in new, great space. I love that cardigan! It looks so soft and the color is beautiful! I’m loving this soft look!! They’re a completely different formula. Kiss and blush feels lighter and more like an airy gloss while this ysl feels like a true lipstick. For everyday natural makeup, I like kiss and blush and for more of a saturated look I like this ysl, rouge volupte. Love the pale baby pink! Can’t beat a relaxed, but feminine look like this! love the shoes and jeans! Loving those shoes and sunglasses. Thanks for sharing! Congrats on getting your house finished! I’m dying to see pictures of how it all turns out! I love this easy and casual look! This is the PERFECT casual look! I’ve always loved open, flowy cardigans and this one is so beautiful! The jeans are the perfect match with the slim fit and the distressing. I adore those flats-can’t say enough about how perfect they are! Good luck moving! It is such an exhausting process. I can’t wait until you are all settled into your gorgeous new home. OMG, love this! You look very simple chic, and the soft pink is perfect on you. 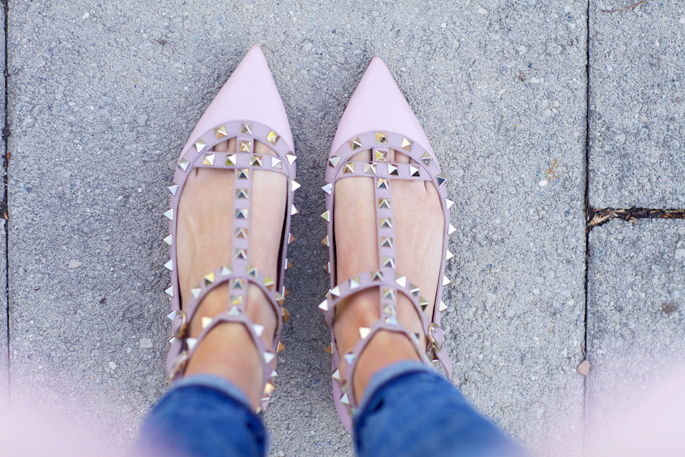 I deeply love Valentino rockstud! You’ve assembled so well this outfit! Rachel this is such a pretty look. Love that it is that soft pink I am loving for spring. So pretty on you. You always have the prettiest, soft looks! Love that shade of pink! So sweet and feminine. Love that you worse flats. I love this lovely pink touches this outfit has. So perfect for spring and you are gorgeous as always! Have a great weekend! 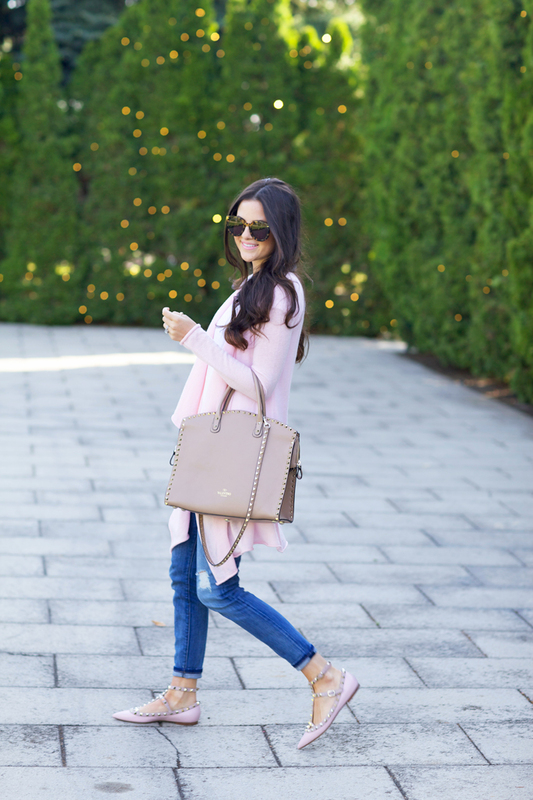 Love the soft, easy look; pink always a winner & love the jeans. Love this cardigan! It looks super comfy! Your shoes!!!! Your bag!!!! This look is so feminine and simply…pretty! I really love this look! The perfect pink, so feminine and effortlessly catchy! I salute you for having the energy to move and blog at the same time. It must be a nightmare dealing with the chaos but hopefully everything runs smoothly in your new house. Those jeans & cardigan look so comfy! Casual and chic look :) Love the cardigan! Congrats on moving into your gorgeous, gorgeous home! Lovely meeting you at rewardstyle; I always love your outfit shots! Pink is definitely your colour Rach! Love this whole ensemble. Happy weekend! I loveeeee those valentinos! I actually prefer the flats than the heels now that I’ve seen it on u!! Gorgeous <3 love the colors and casually feminine look! I’m loving this whole look on you! Absolutely love the simplicity but femininity of this outfit!!! Love the colour palette. Nice casual outfit. The pale pink is so pretty! Love how your cardi & shoes match. I saw studded heels for the first time on your blog and fell in love. I’m loving the flats as well! You pull of both looks so well! Hope you are enjoying your new home! I’ve been drooling over everything Rockstud these days and you might have convinced me to go with the flats. Out of curiosity what size do you wear? I don’t know if my feet would look way too big or not!! !